I thought some here might be interested in this. I'm planning a four day trip towards the end of December (Fri, 23rd to Mon, 26th) that starts at the west side of the Bradshaw Trail and ends at either the Imperial or Kofa National Wildlife Refuge in Arizona. Most of what I have in mind are areas that I have yet to travel. However, I don't want to stick to a strict or rigid route and schedule. I can always bypass an area I've already seen if looks like we're running short on time. Start out along the East side of the Salton Sea to the Bradshaw Trail. The end of this trail will put us just a few miles from the Cibola Wildlife Refuge, along the Colorado River. Set up camp somewhere along the river. From Cibola Wildlife Refuge, head south to Black Mountain Road to Indian Pass Road which heads into Picacho State Recreation Area. Follow Picacho Road to Ferguson Road which will take us to a backwater lake along the river. Camp next to Ferguson Lake. Break camp at Ferguson Lake and head into Arizona to Martinez Lake. Take Red Cloud Mine Road into Imperial NWR, which will take us to the Arizona side of the Cibola Wildlife Refuge. North of Cibola Lake, follow Ehernberg-Cibola Road east through Yuma Proving Grounds to Highway 95. Enter Kofa NWF, a short distance away, and make camp along Palm Canyon Road or Kofa Queen Canyon. Break camp and head south along Hwy 95 to King Road and Castle Dome Mountains. Make our way along trail to Big Eye Mine and eventually back to Hwy 95 and back home. If anyone's interested, be sure to post up! 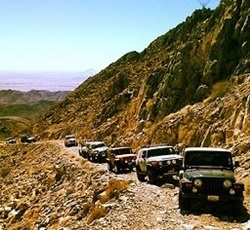 Bradshaw Trail: Nicknamed the Gold Road at one time, is an historic overland stage route in Southern California which originally connected San Bernardino, California to gold fields in La Paz, Arizona, some miles north of Ehrenberg. It was the first road connecting Riverside County to the Colorado River. Cibola Wildlife Refuge Trail: Cibola NWR is located in the floodplain of the lower Colorado River and surrounded by a fringe of desert ridges and washes. The refuge encompasses both the historic Colorado River channel as well as a channelized portion constructed in the late 1960's. Along with these main waterbodies, several important backwaters are home to many wildlife species that reside in this portion of the Sonoran Desert. Because of the river’s life sustaining water, wildlife here survive in an environment that reaches 120 degrees in the summer and receives an average of only 2 inches of rain per year. We invite you to visit and enjoy the many wildlife-oriented activities the refuge has to offer and enjoy the scenic beauty of this oasis in the desert. A great trail to use all year round with a low difficulty and plenty of beautiful views, this area is quite popular. This trail is suitable for passenger vehicles and mountain bikes. Black Mountain: A partially difficult trail, Black Mountain Road starts at California 78 and ends near Ogilby and Indian Pass Road. 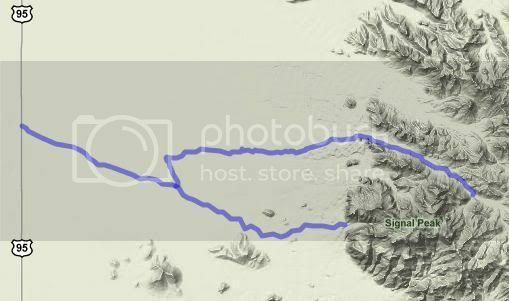 The good news is that you can travel this route in a passenger vehicle as well as a 4WD and you can start this trail from the start and end point as well. It is better however that only 4WDs do this trail in reverse as climbing up the Black Mountain from the south is not easy. You are often propped up at an angle of 35 degrees at some places. Your trail at first takes you on a graded road along the base of Black Mountain. This soon changes to a single-lane paved road as you start ascending the northern section of the mountain. The terrain is largely made up of black volcanic boulders and a mix of vegetation like ocotillos, chollas and creosore bushes. As you ascend to the Imperial Sand Dunes some nice views greet you. At the top of the Black Mountain you see communication towers. The view also includes Chocolate Mountains, parts of Colorado river, Arizona, Cargo Muchacho Mountains and Picacho Peak. When you descend the Black Mountain the trail again turns into a dirt road and it gets quite steep. As the ground is made up of loose soil which gets worse when it rains, it is better to hike the way down. At the bottom, the trail moves across a bajada and small washes. This is not the typical Colorado River party zone, campers are mostly kayakers, fishermen, birders and hikers. The area has two boat launch ramps as well as fish cleaning stations where you can clean your channel and flathead cats, blue gill, and bass. The area has some nice hikes and great picture taking opportunities. What was left of the old gold mining town of Picacho was inundated when Imperial Dam was built and the old cemetery was moved near the camping area. Red Cloud Mine Road & Imperial National Wildlife Refuge: The Imperial National Wildlife Refuge protects wildlife habitat along 30 miles (50 km) of the lower Colorado River in Arizona and California, including the last un-channeled section before the river enters Mexico. The Imperial Refuge Wilderness, a federally designated, 15,056-acre (60.93 km2), wilderness area is protected within the refuge. The river and its associated backwater lakes and wetlands are a green oasis, contrasting with the surrounding desert mountains. It is a refuge and breeding area for migratory birds and local desert wildlife. The Red Cloud Mine Road is the only scenic drive on the property, and if you want to go further than to the Painted Desert Trail, you'll want a good, high-clearance 4WD under your seat. There are lookout points at the Mesquite, Ironwood and Smoke Tree pullouts. Meers Point offers a boat launch with tables and toilets on the shore. The Painted Desert Trail is a 1.3-mile self-guided trail though an area of 30,000-year-old volcanic activity that also offers some great views over the Colorado River valley. Kofa National Wildlife Refuge: For 57 miles, US 95 cuts through the desert of Southwest Arizona - quite flat, perfectly straight and aligned exactly north-south, and interrupted only by the small town of Quartzsite. In the mild seasons of winter and early spring, much traffic uses the road, bringing sun seekers from all over the US to Yuma and on into Mexico, but few travel to this region in summer, when temperatures of over 120°F are not uncommon. Rain falls on only a few occasions each year - the summer thunderstorms that affect the higher areas of Arizona rarely extend this far. South of Interstate 10, US 95 is bordered by the Yuma Proving Ground to the west and the Kofa National Wildlife Refuge to the east - a protected area 25 x 40 miles in extent with no paved roads or facilities of any kind. 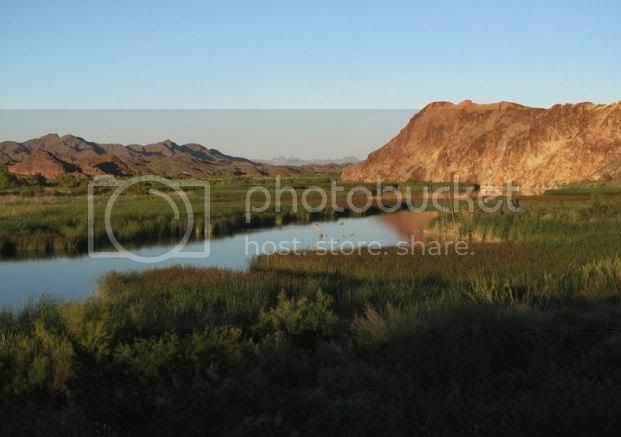 The refuge is an excellent place for viewing desert plants and wildlife, rock climbing, exploring old mines, or just camping in remote wilderness. Palm Canyon Road: This graded dirt road provides access to Palm Canyon, from where a short hike leads to views over what is possibly the only community of native palms in Arizona. The trail itself is suitable for passenger vehicles. This area has sweeping views west over the La Posa Plain to the Trigo Mountains and Chocolate Mountains and is especially lovely at sunset. The California palm fans, from which the canyon derives its name, are thought to be remnants from an era when Arizona was a lot cooler and wetter than it currently is. The cooler air within the canyon, lack of direct sunlight, and slightly moister conditions have allowed the trees to survive. The hiking trail to view the palms is a rough but well defined path that climbs up into the canyon for half a mile to a viewing point. Kofa Queen Canyon: This spur trail is one of the few within the Kofa NWR that treavels up one of the high walled red canyons that penetrate into the rugged Kofa Range. After leading off from Palm Canyon Road, the trail is smooth and easy going for the first 4 miles. At 4.3 miles is a large flat area good for camping. At the mouth of the canyon the trail drops into a gravelly wash and remains in it until the end of the route. Big horn sheep like the habitat within the canyon and can often be seen in the early morning and evening high up on the canyon walls. The wash is generally loose and gravelly, with only a few rough boulders to contend with. The last mile, however, is quite brushy, and most vehicles will collect a few scratches. From CA 78, 2.8 miles north of the intersection with Ogilby Road (S34) and 0.3 miles north of mile marker 55, turn east on a graded dirt road signed as Black Mountain Road, marked M185, directly across form Imperial Gables Rd. Of course, if anyone else feels like joining for just a day or part of the route, that's okay too.